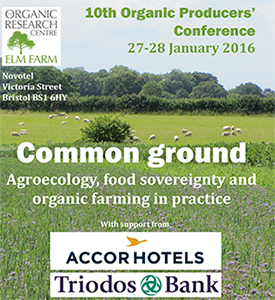 The 10th Organic Producers' Conference will be held at the Novotel Bristol City Centre, Victoria Street, Bristol BS1 6HY. This year we are holding our conference in tandem with the SOLID organic dairy conference at the same venue on 26 January to maximise the opportunities for participants to attend both events, with a total of 3 days of exciting presentations, debates and exhibitions. This year we will focus on what we have in common as organic, biodynamic, permaculture, agroecology and food sovereignty movements and how we can communicate our shared values to deliver better food, farming and health. As usual we have a range of practical technical sessions, on the themes of; new entrants/converters, arable, horticulture, grassland, and food policy/sovereignty. For more information about the conference programme contact Phil Sumption. Proceedings of this conference will be uploaded here, soon after the conference.